Step 1: Click the ‘List Builder’ tab at the top of the home page to start building your business to business marketing lists. Step 2: Under ‘Filter by’ on the left hand side on the page, click the different tabs to select the criteria to build your list. If you want to use Thomson Directory codes to select businesses, click on ‘Business Activity’ to expand the box, then select ‘Thomson Directory Classification’ from the drop down menu to build your list using classifications from the Thomson directory. Once you have selected the required criteria, the number of records will be displayed in the ‘Count’ indicator on the top left hand side of the page. 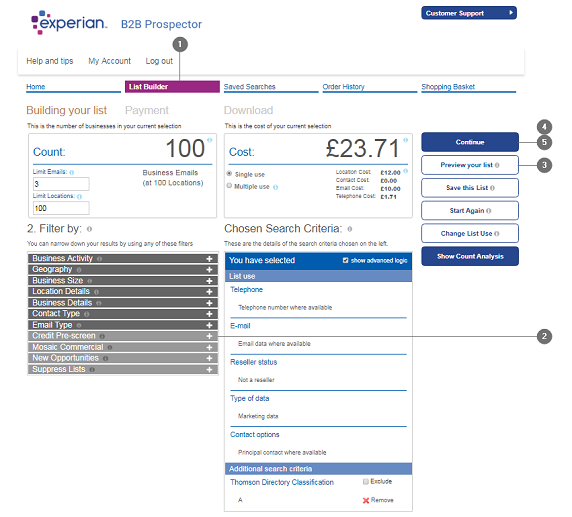 The costs for this list are displayed in the ‘Cost’ box on the top right hand side of the page. Costs for both the total list and individual record costs are displayed. To buy part of your business to business marketing list, enter the number of records you want to buy in the Count limit box. This will randomly select records from the filtered list. Step 3: The list can be previewed by selecting ‘Preview Your List’ from the list of options on the right hand side of the page. Two extra functions are available on the list builder page if you are logged in. They are Advanced Logic, and Cross Tabs. Step 4: Add extra details. Once you have performed data filtering, click Continue and choose the details you want added to your list. This allows you to add a wide variety of useful extra data when analysing your list. You can add turnover, number of employees, mail sort and other postal code information. Your chosen details can be viewed in the centre section of the page. Step 5: Add your business to business marketing list to your basket to purchase.